Alyson Haas grew up in Texas and has called Houston home for over 10 years. In addition to being a mom to two kids, Blake (8) and Claire (5), she co-founded Vinglacé and stays involved with her kids’ schools. She also enjoys working out, playing tennis, and making sure her family has a steady diet of healthy foods. What was your biggest discovery in 2017? My biggest discovery has been how much work goes into starting a new business. 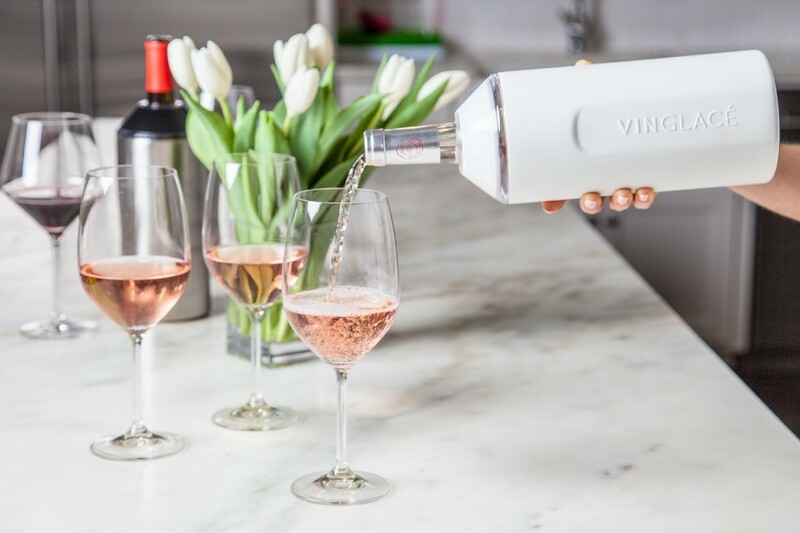 We recently launched Vinglacé — an elegant container to maintain your wine and champagne temperature for hours. You think you know, but does anyone really know?! It’s all hands on deck at our house, and no job is too small. That saying, “when someone buys from a small business, an actual person cheers” is so true. If my husband’s phone chimes at dinner, letting us know we made a sale online, even my kids shout hooray! What hurdles did you face in 2017, and how did/are you navigate those? When you launch a new product, you have no idea how it will be received. We know we’re fulfilling a need in the market, but will it catch on quickly? Figuring out how much product to order to be prepared for the holidays was something we really had to think about. We also didn’t fully realize how the engraving aspect of our product would take off — it’s extremely popular. So yes, it’s a bumpy ride starting a business, but we have business owner friends who have offered a lot of guidance, and I’d say our entrepreneurial feet are starting to feel a bit more settled. What is getting you pumped up for 2018? Well, 2017 has been more than we could have ever hoped for — we’ve been on The Today Show and Good Morning America, and Gwyneth Paltrow’s GOOP put us on their Holiday Gift Guide. If 2018 can beat that, I’m ready for it! We have a new color coming out in the spring that we previewed at a few recent events, and the response has been great. We are taking our product to market in Dallas, Atlanta, and New York for the first time, which will give us exposure to retailers from all over the country. In April, we’ll celebrate one year in business! When you’re not thinking about business, what occupies your daydreams? My husband and I love to travel; we are always thinking of new places to visit — either just the two of us, or with family. Sun and sand always make me happy, so when I’m packing up shipments, I like to daydream about being on the beach. What is in your “entrepreneurship” emergency kit? RX Bars — I’m obsessed. The “How I Built This” podcast, which features successful business owners, like the founders of TOMS, Whole Foods, and Kendra Scott. I listen to them when I’m running. A chilled bottle of wine, in a Vinglacé, of course. Meet Innovate Celebrate’s Top 5 Finalists for ‘Startup of the Year’!